St. Anna Bay sets a unique stage for the ensemble of buildings and public spaces protected by UNESCO World Heritage designation. Its shores and adjacent neighborhoods are home to island residents, businesses, civic institutions and government. Its waters link the world’s shipping lanes to the island’s industrial harbor. Before the telephone, airport and internet, St. Anna Bay was the primary gateway to the island and conduit to the outside world. Over the past several decades, Curaҫao’s maritime trades have changed. Increased vessel size and cargo containerization has reduced the inherent value of the berths and sheds along St. Anna Bay that once welcomed this traffic. Small Venezuelan cargo vessels have replaced the vibrant merchant ship activities of old along Scharloo and Kleine Wharfs. Mathey Wharf continues to welcome cruise vessel traffic, but the largest visiting vessels now berth at the Mega Cruise Ship Berth at Rif Fort. 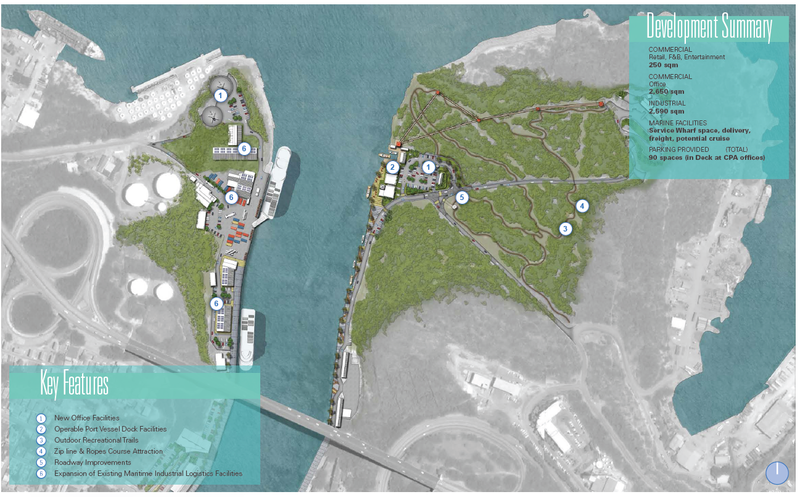 Always with the mission in mind of putting the waterfront to work for the social and economic benefit of the island, the Curaҫao Ports Authority prepared a Master Plan to serve as an actionable strategic document guiding the realignment of waterfront assets along St. Anna Bay and Waaigat. 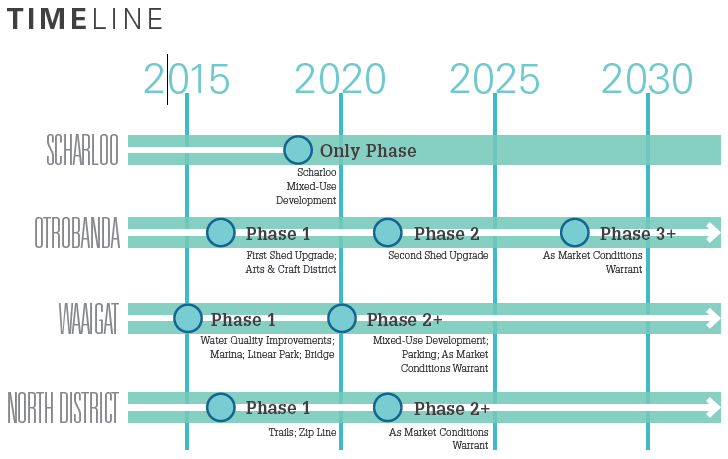 The Plan is the result of a series of interactions with stakeholders holding roles throughout the community, downtown merchants, and the general public over a 6-month timeframe. Four guiding principles underpin the long range success of each planning area and the inner harbor overall. Working together, they form a framework by which the proposed use and activity mix can succeed. They also transfer value to surrounding sites, fostering neighborhood resiliency and lifting prospects for renewal and redevelopment. Making the inner harbor accessible to the public is a central tenant of this plan. Where feasible and practical, all plan concepts bring people to, along, and onto the water by opening up views from surrounding neighborhoods, connecting the adjacent street network to project sites, creating an interconnected harbor side “loop” of pedestrian paths and parks, and punctuating the edge with new marine activities accessible to residents and visitors. The waterfront should be celebrated by these connections as the public’s central park and meeting place. 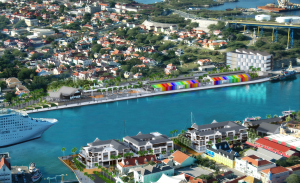 Waterfront renewal must support the related goals of nurturing continued revitalization of Willemstad and increasing residential and visitor populations in the downtown core. To this end, plan concepts support residential and related supporting uses within several of the subject sites. Concepts overall work to unify surrounding neighborhoods and commercial districts to the inner harbor by naturally extending city blocks and street networks, keeping development densities in check, preserving buildings and community connection to historical waterfront uses, and providing community services and amenities. St. Anna Bay and Waaigat are natural features central to the UNESCO World Heritage district; they serve as the backdrop by which Willemstad and its respective neighborhoods took root and flourished. First and foremost, renewal of subject properties needs to preserve and protect the integrity of the UNESCO World Heritage district overall and Punda, Otrobanda, Pietermaai and Scharloo. Renewal should also work to highlight the uniqueness of each of these neighborhoods and encourage both residents and visitors to explore, connect and learn about Curaçao and its people through the built environment and deliberate programming of public spaces with street life, concerts, art, history and other social gatherings. As it did in the past, the inner harbor should support continued economic activity and employment. To this end, plans support a mix of uses that will provide direct and indirect economic benefits to Curaçaoans. Plans seek to reaffirm, through its design and mix of uses, the inner harbor as a commercial center and unparalleled visitor destination, encouraging more frequent and extended visits by residents, long stay guests and cruise passengers. Mix of use also allows for the cost of public amenities such as parks and pedestrian zones to be offset by revenue generating uses and private investment. Sites also maintain and expand maritime activities along their docks, from continued utilization of Mathey Wharf as a major cruise ship berth, promoting marine industrial uses within the north district, to an expansion of recreational activities in Waaigat and along Scharloo. 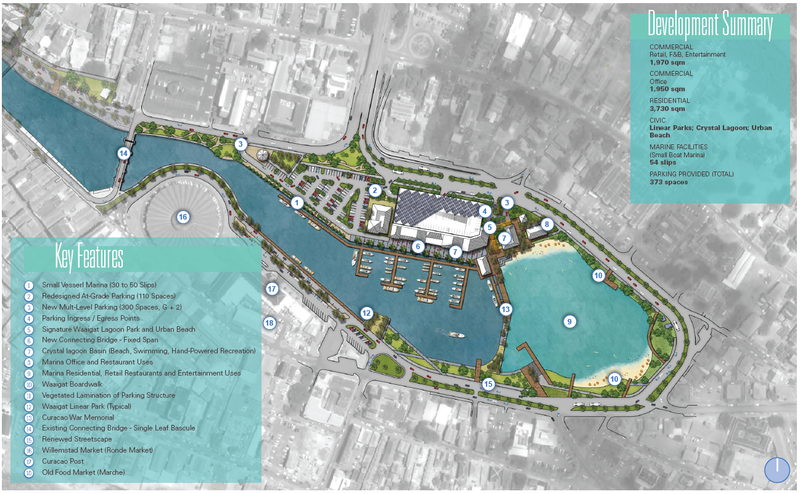 By following these principles and through engagement with stakeholders across the Island, a vision for the waterfront was crafted. This vision seeks to transform St. Anna Bay and Waaigat into a compelling sequence of places for residents and visitors alike. 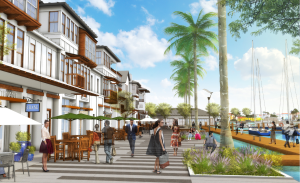 It offers a balanced development approach, integrating retail, office, maritime, arts and park uses, which, working together will promote extended live, work and recreational pursuits by residents and visitors. 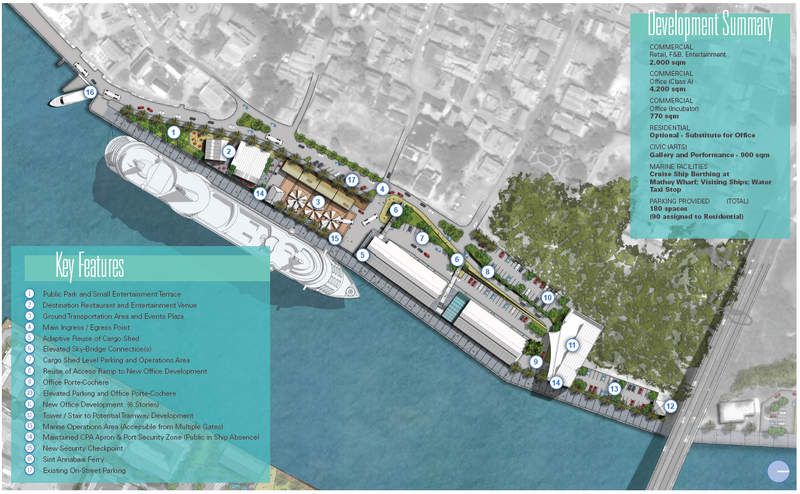 It provides a template for each location to develop a unique identity tied back to its namesake surrounding community while also offering elements and infrastructure that provide a complete, connected waterfront experience for users. The Master Plan for St. Anna Bay holds true to its roots, supporting a number of exiting maritime activities while also introducing new ones in several locations. Mathey Wharf continues to welcome cruise homeport and port-of-call operations as well as visitation by other vessels. Venezuelan merchant vessels are relocated into a new facility within the industrial harbor, allowing Scharloo and Kleine Wharfs to open up for yachting and other small leisure craft activities. Waaigat lagoon is enhanced through introduction of a marina facility supporting between 30 and 50 slips. The North End remains a locus of petroleum and marine industrial operations, with new enhancements offered to bolster these activities. The Master Plan covers four areas under CPA administration. 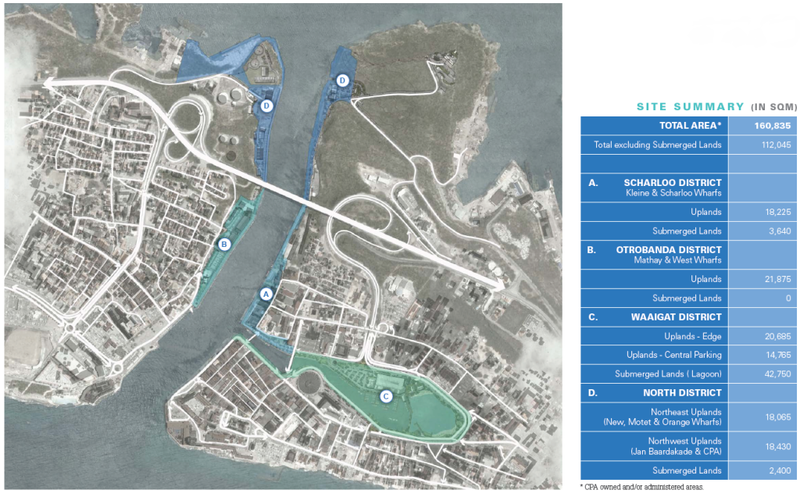 These areas include Scharloo and Kleine Wharfs; Otrobanda’s Mathey Wharf; the Waaigat lagoon; and properties immediately north of the Queen Juliana Bridge. In total these properties account for over 16 hectares of shoreline and submerged lands. 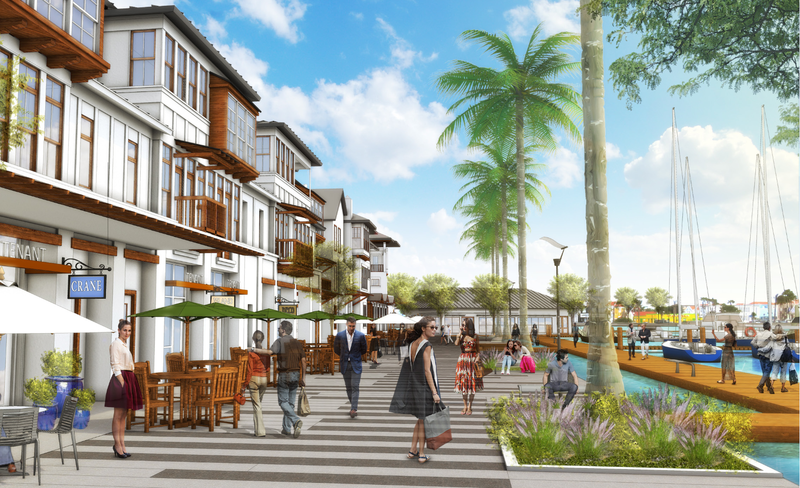 The commercial maritime role these properties fulfilled in the past resulted in a pattern land use common in waterfronts worldwide; communities and neighborhoods developed away and disconnected from the water’s edge. 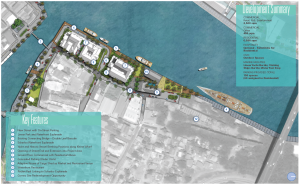 Renewal of portions of the St. Anna Bay waterfront hold promise to reverse this traditional arrangement, opening Scharloo, Otrobanda and Punda districts directly onto the water’s edge. 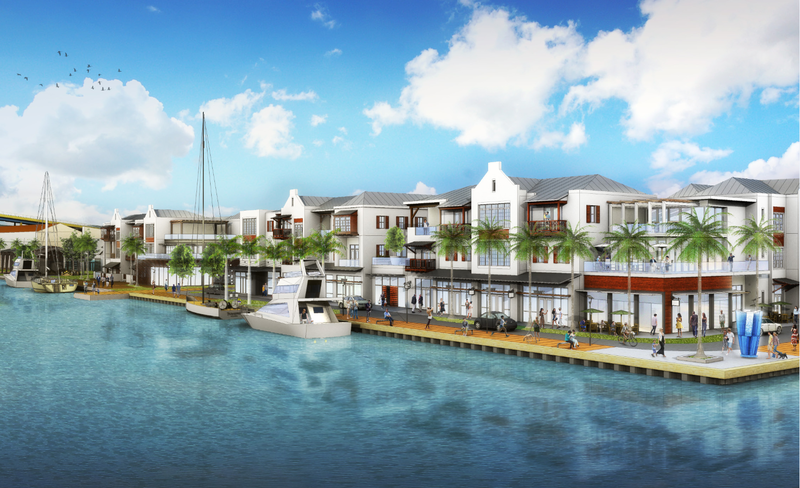 The properties and edge of Kleine and Scharloo Wharfs present an unparalleled opportunity to build community and extend the fabric and vibe of Scharloo and Punda to the water’s edge. 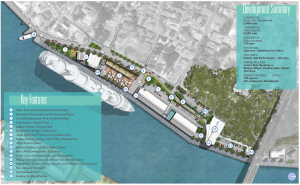 The vision calls for streets from the surrounding neighborhood to extend into the project area, creating space for a sequence of urban blocks along a new waterfront esplanade. Ground floor restaurant, entertainment and small retail establishments give way to residential and hospitality uses above. The entirety of the district is linked by new parks and pedestrian ways for the public to enjoy. The design concept for Otrobanda reflects the diversity of its namesake. The vision seeks to create a hip, urban cultural space with food, retail, small businesses, arts and performance venues housed in a repurposed Mathey Wharf cargo shed. Mathey Wharf continues its use as a key maritime berth, welcoming cruise and other visiting ships. When vessels are not present, the waterfront and hardscape plazas open to provide a unique outdoor and public venue for concerts, performances and social gathering. For Waaigat, solving the area’s water quality issues is the first order of business. The vision calls for redevelopment of the lagoon’s edge and installation of new infrastructure to eliminate wastewater and storm water release. Following this and other water quality enhancements, landside improvements are introduced, inclusive of a linear park, lagoon bridge, small marina and a mixed-use development supporting restaurant, office, residential and civic uses along with expanded parking. 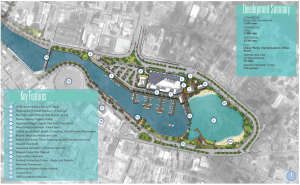 A portion of the lagoon could be transformed into an iconic, urban beach linked to the vibe and spirit of Punda and Pietermaai. 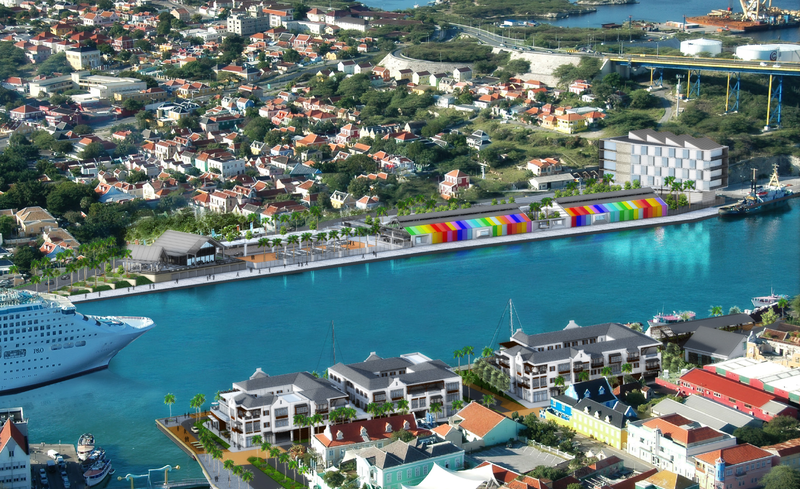 For properties north of the Queen Juliana Bridge, the vision calls for a continuation of maritime commerce and industry. To the west, the plan seeks to upgrade site infrastructure making it capable of safely accommodating fuel ship activities while also expanding the potential for this area to provide a logistical nexus for industries supporting the offshore energy sector. To the east, the Curaҫao Ports Authority site is upgraded to house a greater number of maritime office users as well as provide a more public face and point of interaction through introduction of recreational facilities. Advancement of this vision will bring lasting quantitative and qualitative economic impacts for the island of Curaҫao . Estimates of economic impact suggest redevelopment will lead to one-time employment impacts of over 1,600 jobs over the course of construction, with nearly 2,200 additional indirect and induced positions. Reoccurring economic impacts are also highly favorable, with an estimated 1,200 direct, indirect and induced jobs in a variety of sectors. An estimated US$93 million in annualized wages with benefits as well as direct and indirect expenditures are forecast as full realization of the project is achieved. These impacts will occur through both project construction and daily operations. 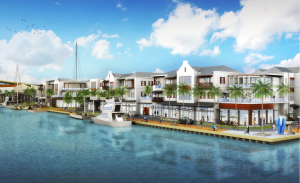 Inner harbor renewal will spur continued community revitalization efforts throughout Willemstad and increase visitation to the island. Social benefits will also accrue to adjacent neighborhoods through increased employment opportunities and improvement in the overall character of the area. The full realization of the vision for St. Anna Bay is a long-range endeavor, with each investment building a foundation for the next phase. In the end, this vision and the Curaҫao Ports Authority seeks to put the waterfront to work for Curaҫao. Working to bring vibrancy and renewal to downtown. Working to reignite underutilized properties into economic activity. Working to create great places for the enjoyment of current and future generations.